Perry’s Steakhouse & Grille's newest addition to its wine portfolio, Perry’s Reserve Pinot Noir, a 2017 vintage from the coastal Monterey County CA vineyards. 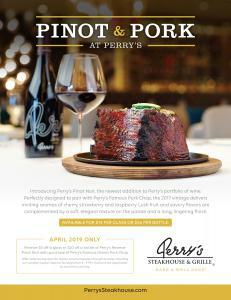 HOUSTON, TX, UNITED STATES, April 3, 2019 /EINPresswire.com/ -- Perry’s Steakhouse & Grille is pleased to announce the newest addition to its portfolio of wines, Perry’s Reserve Pinot Noir, a 2017 vintage from the cool, coastal Monterey County California vineyards. The first vintage of Perry’s Pinot Noir is now available at all steakhouse locations for $14 per glass or for $56 per bottle. 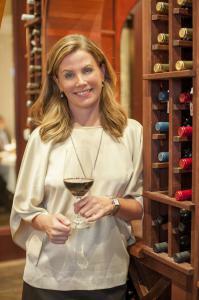 To celebrate the newest addition to Perry’s wines, the restaurant will offer a special “Pinot & Pork” promotion. 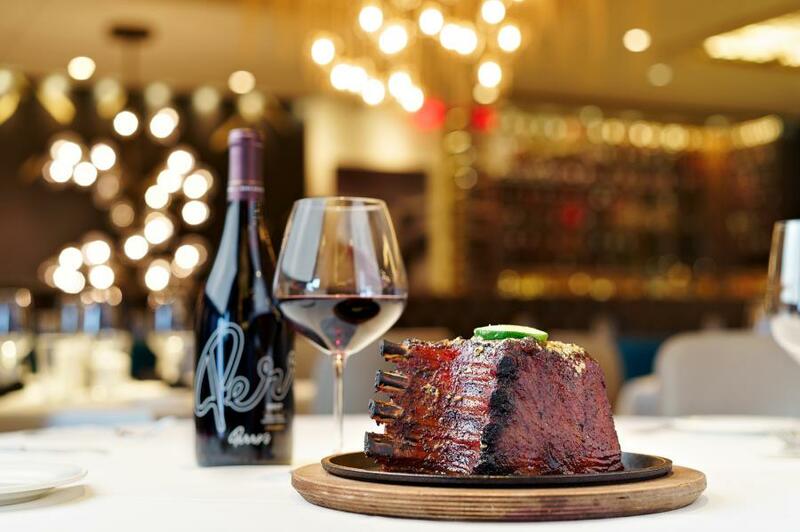 Throughout the month of April, guests can get $5 off the per-glass price or $20 off the per-bottle price of Perry’s Reserve Pinot Noir with the purchase of Perry’s Famous Pork Chop during dinner service. The offer, which is valid during dinner service Monday – Sunday during April 2019, can be combined with Perry’s 3-course Pork Chop Sunday Supper Special available for $34.95 on Sundays from 4 to 9 p.m. This special Pinot Noir pricing is not applicable to Perry’s Social Hour. Perry’s 2017 Pinot Noir delivers inviting aromas of cherry, strawberry and raspberry. Lush fruit and savory flavors are complemented by a soft, elegant texture on the palate and a long, lingering finish. Perry’s Reserve Pinot Noir also pairs well with the restaurant’s Chicken Parmesan or grilled fish, in addition to its Signature Pork Chop. “Wine-making is a process of understanding and balancing the characteristics of grapes to best complement one another. We are pleased to add Perry’s Reserve Pinot Noir to our already impressive portfolio of wines, including our 2017 Reserve Chardonnay, 2016 Reserve Cabernet Sauvignon and 2015 Big Red Blend,” says Zivanovic. Perry’s Steakhouse & Grille has earned a faithful following by perfecting prime since 1979. Beginning as a small butcher shop, Perry’s has grown into a renowned group of award-winning restaurants featuring USDA Prime beef, tableside carvings, signature selections, flaming desserts and handcrafted cocktails at its Bar 79. Specializing in a Rare and Well Done® experience, Perry’s currently operates 15 steakhouse locations in Chicago, Birmingham, Denver and across Texas, as well as the two original butcher shops now known as Perry & Sons Market & Grille. For more information and updates on Perry’s Steakhouse, please visit www.PerrysSteakhouse.com.